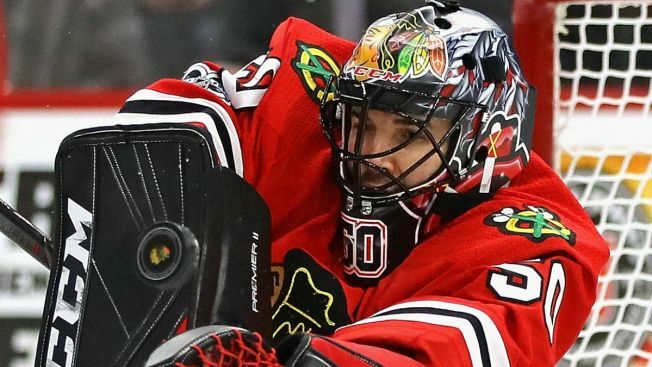 In the aftermath of a bombshell report that Chicago Blackhawks goaltender Corey Crawford could miss the rest of the season, there are disagreements on what exactly is going on with the netminder. Mark Lazerus of the Chicago Sun-Times reports that Crawford is dealing with vertigo-like symptoms that could keep him out for the rest of the year, but in a radio interview, Blackhawks Senior Advisor Scotty Bowman disagreed with that report. “It’s not what they’re reporting,” he said. “He got hurt at the beginning of the season. I think it was a concussion, and now what he really has is post-concussion syndrome. “Concussions are all over the map. Vertigo is not the answer,” he added. The Blackhawks have not revealed the exact nature of Crawford’s injury, nor have they said when they expect him back. All that the team has announced is that he has an upper-body injury, and that he is on injured reserve. Crawford has missed the team’s last 10 games since leaving the team’s 4-1 loss to the New Jersey Devils on Dec. 23. Since then, the Blackhawks are 5-4-1, and are currently in last place in the Central Division standings.